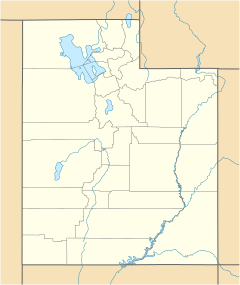 The Provo River is located in Utah County and Wasatch County, Utah, in the United States. It rises in the Uinta Mountains at Wall Lake and flows about 71 miles (114 km) southwest to Utah Lake at the city of Provo, Utah. The two main branches of Provo River are North Fork Provo River and South Fork Provo River. The river is impounded by Jordanelle Reservoir at the north end of the Heber Valley. Deer Creek Dam further impounds the Provo River with Deer Creek Reservoir, which was built in 1941. The two branches of the Provo are split into upper, middle, and lower sections. 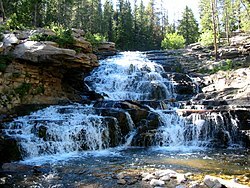 The upper Provo originates in the high Uintas and flows into Jordanelle Reservoir. Below the dam of Jordanelle to Deer Creek Reservoir is known as the Middle Provo river. The lower section of the Provo river flows out of Deer creek reservoir through Provo Canyon and into Utah lake. Pre-contact Ute Indians called the river Timpanoquint, meaning "water running over rocks." Early settlers changed the name to Provo, after trapper Etienne Provost, for whom the city of Provo, Utah is also named. In addition to Provost, the Quebec-born fur trapper was known as Proveau and Provot (and the pronunciation was "Provo"). The old name for the river was instead given to the mountain to the north, which later became known as Mount Timpanogos. In the 1930s irrigation usage and drought had shrunk Utah Lake from 850,000 acre-feet down to 20,000, prompting a reworking of irrigation systems and the creation of the Provo River Project, later called the Provo River Water Users Association. Through the Project river management features were added including the Deer Creek Dam and Reservoir—with a reservoir capacity of 152,864 acre-feet—and Duchesne Diversion tunnel allowing water from the Duchesne River to be diverted into the Provo River at certain times. The Association today maintains and operates these control and irrigation systems and monitors water flows. According to the United States Geological Survey (USGS), variant names for Provo River include Tim-pan-o-gos River and Upper Provo River. The Provo river is an excellent place for outdoor enthusiasts. Fishing is a popular activity along all stretches of the river, with trout commonly found in the river. Running and biking are common on the Provo River Parkway, a 15-mile trail along the river from Utah Lake to Vivian Park in Provo Canyon; and floating the river in inner tubes is popular during the summer. ^ a b c d "Provo River". Geographic Names Information System. United States Geological Survey. December 31, 1979. Retrieved March 11, 2009. ^ a b c "Water-data report 2007: 10163000 Provo River at Provo, UT" (PDF). United States Geological Survey. Retrieved March 11, 2009. ^ LeRoy R. Hafen (1965). Trappers of the Far West: Sixteen Biographical Sketches. University of Nebraska Press. p. 1. ISBN 0803272189. Retrieved 2013-12-15. ^ Bell, Tina Marie. "Provo River Project". US Bureau of Reclamation. Retrieved September 9, 2018. Wikimedia Commons has media related to Provo River.